[163 Pages Report] MarketsandMarkets forecasts the global mobile application security market is expected to grow from USD 808.8 Million in 2015 to USD 2.5 Billion in 2020 at a compound annual growth rate of 25.7% during the forecast period. Mobile apps such as gaming apps, social media, and shopping apps are at the core of this market. The growing adoption of mobile devices among users has changed the process of sales, marketing, and branding of a product. The companies now prefer to introduce mobile apps to their customers to make purchase. The rising downloads of these apps and increasing use of mobile devices to visit various company websites has increased the risk of cyber-attacks and violation of security policies. This has laid the foundation for mobile application security solutions. The mobile application security market has been segmented on the basis of solutions, deployment types, user types, and industry verticals. The global market is segmented on the basis of regions into North America, Europe, Asia-Pacific (APAC), Middle East and Africa (MEA), and Latin America. 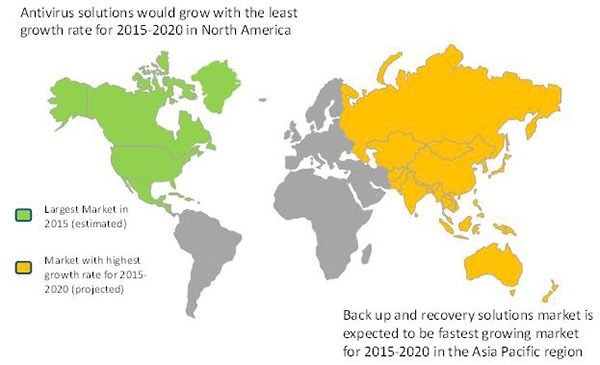 The global market is provided for each region from 2015 to 2020. Major players of the mobile application security ecosystem were identified across region and their offerings, distribution channel; their regional presence was understood through in-depth discussions. Also, average revenue generated by these companies segmented by region were used to arrive at the overall mobile application security market size. This overall market size is used in the top-down procedure to estimate the sizes of other individual markets via percentage splits from secondary and primary research. The entire procedure includes the study of the annual and financial reports of the top market players and extensive interviews for key insights from industry leaders, such as CEOs, VPs, directors and marketing executives. All percentage shares, splits, and breakdowns were determined using secondary sources and verified through primary sources. All possible parameters that affect the market covered in this research study have been accounted for, viewed in extensive detail, verified through primary research, and analysed to get the final quantitative and qualitative data. This data is consolidated and added with detailed inputs and analysis from MarketsandMarkets and presented in this report. The ecosystem for the market comprises mobile application security solution providers, internet service providers, cloud service providers, and verticals. Major companies in the ecosystem are as follows. Mobile Application security solution provider: Trend Micro, Symantec, Virtu, McAfee, and others. The strong inclination toward internet and the need to be connected to the web is driving the market for mobile application security market in all regions. The execution of mobile application security market solutions would allow enterprises to embrace the cloud application services by applying discovery and analysis process for all the devices used across the business network. As workers require access to business information for business purpose, organizations have been encouraging the application of mobile application security for concurrent malware scanning, URL filtering, and strong content scanning. Increasing malware threat and growing demand for end-to-end security suites are pushing the growth of the mobile application security market. However, it is anticipated that the major vendors would face stiff competition from the local vendors from diverse regions. On the flip side, the lack of acceptance from large enterprises would hinder the growth of this market. The mobile application security market is a consolidated market with big players, such as Symantec, McAfee, VMware, Avast Software, Trend Micro, MobileIron, AirPatrol Corporation, Lookout, AVG Technology, and Kaspersky. Majority of these players adopted both organic such as new product developments as well as inorganic growth strategies such as partnerships and collaborations with various other vendors to cater to the growing needs of this market.